Save on Fallout, Prey, Dishonored, Doom and pretty much everything else. Even though you won't be able to play Fallout 76 on Steam at launch, almost everything else in Bethesda's back catalogue is discounted on Valve's platform this weekend, just in time for QuakeCon 2018. While I can't find a dedicated Steam page for the sale just yet, probably because it began very recently and Dead Cells is currently occupying the homepage, you can see the discounts by heading to Bethesda's publisher page on Steam and scrolling down to 'specials'. Some highlights include Prey on-sale for £10/$15, and its roguelite-style DLC Mooncrash for $15/£9.74, which is 25% off. 2016's Doom is just $10/£7.49 (Fanatical has it slightly cheaper), which is reasonable for what's probably the best singleplayer FPS of the modern age. Fallout 4's GOTY edition is £20/$30, matching its best Steam price to date if you've somehow not played that yet. And of course, no mention of 3D Fallout games can go without also bringing up New Vegas, the vanilla edition of which is $3.29/£2.63. I paid double that for a chocolate-flavoured beer last weekend. The beer was fantastic, but New Vegas will definitely last longer. The excellent Wolfenstein 2, give or take two annoying final bosses, is $24/£16. The Elder Scrolls Online and its various expansions are also discounted, plus you can get the entire Elder Scrolls series for less, too. 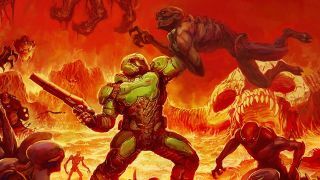 If, like me, you have most of those, you can instead look forward to QuakeCon itself this weekend, where we'll be getting our first look at Doom Eternal gameplay.